For 45 years, the Black Gold Rodeo has been a sure sign of the start up of summer in Leduc and this year I had the privilege of volunteering for one of their events. 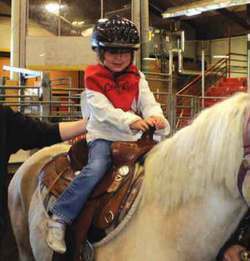 The Rodeo of Smiles is an event for kids who live with a disability to have an opportunity to participate in and enjoy the experience of a rodeo. In their 37th year, the Rodeo of Smiles has been an ongoing special part of the weekend, and a wonderful experience for all those involved. There were over 174 children hailing from both the cities and counties of Leduc and Wetaskiwin, signed up to participate in all the events. This is a mass undertaking every year and lasts only a few hours. It could not be done without the help and support from hundreds of volunteers, service clubs, businesses and the families who live, work, and/or play in the area. Music, laughter and excitement filled the arena as the children arrived. Their little faces said it all. Grins from ear to ear and the happy sounds of laughter as they participated in chuck wagon races, lassoing cattle (the plastic kind), jumping in the bouncy Urban Legend (a giant blow up monster truck), fishing in the wishing well for prizes, horseback rides, petting animals in the petting zoo, and yes, I had to go to that one too and hold a one week old pot belly pig. The squeals from that little guy made all the children look at me as if I were going to have bacon for a snack. Needless to say, I put it down and went back to being an adult helping the children. There were other critters around, two legged as well, such as Bob the Bandit, Critter Coyote, Courage the Dalmatian, and Clowns who made the most unusual balloon creations. Face painting, coloring sessions and just the sheer excitement of all that a child could want, provided a day of magic, fun and wonderment for all. When the time had come to close (it lasted 3 hours and I wanted more, feeling too well what the children were feeling), we all went our separate ways, but not before some of the adults bounced in the monster truck bouncy house!